Above is a collection of saffron jars purchased from a wonderful store in Santa Fe. They are hand-painted wood and anything with marbling instantly attracts me. I have been on a photographing blitz these last few weeks, having professional teams shoot some of my favorite projects. One thing we always discuss on these shoots is the collections I help curate for my clients. I find that the most interesting interiors have some sort of collection represented. In most of the work I do, I love to help clients find touch stones with their past so that they come to fully understand how it influences their current taste. Most of my conversations about early childhood experiences revolve around what they collected. Collecting as a child is not a unique phenomenon, but the items they collect certainly can be. What I find most interesting is what people tend to collect or not to collect as adults. In recent years, I have worked with a variety of younger clients who do not collect anything at all…In fact they readily dispose of items that they do not see as useful or view as clutter. I have been collecting Zuni beaded pieces since my kids were small. It is always an adventure to add a piece to the collection and watch individual artists evolve. The Zuni tribe is in western New Mexico and they are the only tribe that beads in 3D. My collection is curated by holidays with an alien thrown in for good measure (I was born in Roswell)! I am in no way promoting clutter, or hoarding!, but I do think the question of collecting is an interesting one and so I have been reading up on why we collect. Some of the articles are downright disturbing, suggesting that unloved children collect to seek comfort in accumulating. Or that collecting is motivated by existential anxieties and therefore, the collection, which is an extension of our identities, lives on even when we are gone. I am not going to lie…this last explanation definitely hit a nerve as I tend to hold dearest those things which my grandmother collected because I want her memory to be here forever. Another article suggest that the hobby of collecting includes seeking, locating, acquiring, organizing, cataloging, displaying, storing, and maintaining the items being collecting. WOW! I can honestly say that I only take pleasure in the finding and the displaying- I will leave all the other labor to the serious collectors. Perhaps collecting may not seal my permanence here on earth, but while I am here I will keep collecting and sharing. This small collection of antique animal toys resides in my client’s guest bedroom. I found these at a local antique shop and I hope she will hunt for more to add to her collection through the years. 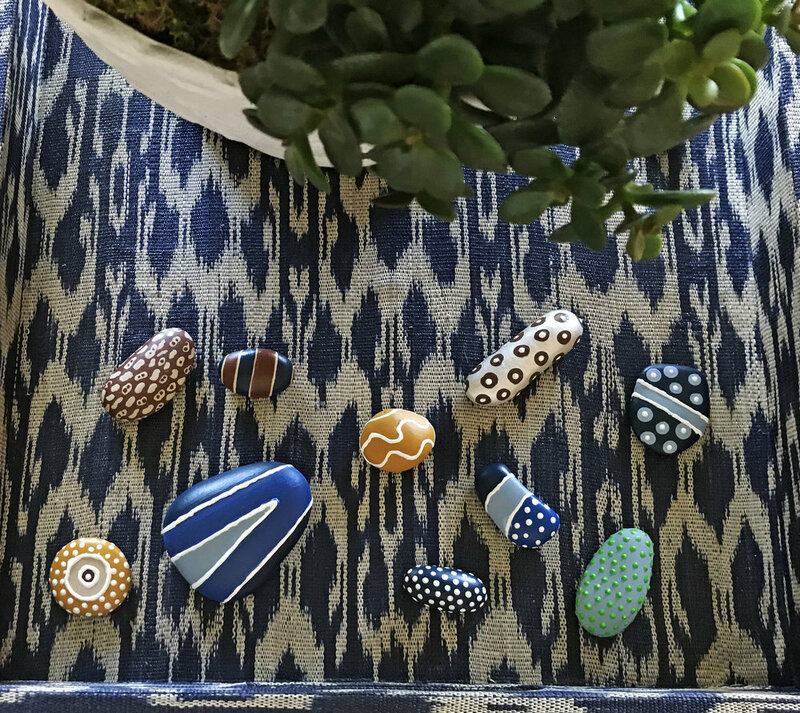 I love this small collection of hand painted rocks. The pattern play makes them an instant curiosity in this tray. Collections are for examining and provoking thought. Sometimes my collecting becomes more like hoarding. This collection of majolica found a perfect home in my client’s family room. I love creating dimensional displays on walls that would be next to impossible to fill with artwork. The clear brackets have a modern feel and don’t distract from the color and a symmetry in this composition. This collection was hard to let go of because I am a sucker for pink, green and aqua. In another tray my client displays Texas paperweights. Paperweights are one of my favorite things to collect because they are affordable and come in so many shapes and sizes. Collecting with a theme is so much fun and makes gift giving super easy. I spent hours searching for these shell encrusted boxes. As a child I remember so many from my visits to the beach. It was so much fun finding such unique specimens and surprising this client created so much anticipation for me. These bunny-themed egg cups and hand-painted Easter eggs were collected for a client whose sweet grandmother went by the nickname Bunny. They are lovingly displayed in a cottage that pays homage to her. My collection of limoge boxes was one of the first things I started. My first piece was given to me in college by a sweet roommate. Do you have a collection you cherish? We would love to hear what it is!